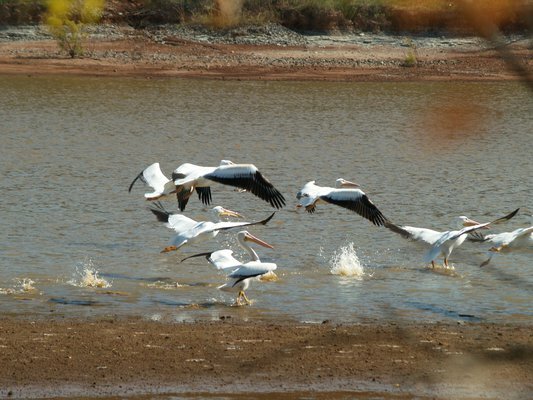 Great Salt Plains State Park in Jet features unexpected natural treasures like its saltwater lake. Did you know Oklahoma has a saltwater lake? Roughly half as salty as the ocean, the Great Salt Plains Lake is a natural wonder comprised of salt left over from a prehistoric ocean that once covered what is now Oklahoma. Catch sight of the amazing waterfowl that visit the lake and see what other fun lies in store at this one-of-a-kind water attraction. The lake is located at Great Salt Plains State Park, where you can dig for selenite crystals and feast your eyes on the white expanse of the Great Salt Plains. It’s a great place to spend the day making memories with the family, or just to enjoy some of the most unusual landscape Oklahoma has to offer. The Salt Plains area is secluded, but the charming small town of Alva is a relatively short drive west. Stop by and check out some amazing murals scattered throughout town courtesy of the Alva Mural Society. Check out the World’s Tallest Man Mural, the Supply Trail Mural, the Castle on the Hill Mural and many more stunning works of public art. If you want to take your northwestern Oklahoma adventure to the next level, continue west toward Alabaster Caverns State Park, where you can tour the largest publicly-accessible Gypsum cave in the world and see some truly spectacular country along the way. Looking for adventure? You’ll find it at Lake Carl Etling on the western edge of the Oklahoma panhandle. Not only is this lake tucked away in one of the state’s most remote corners, it’s also located near the highest point in Oklahoma at the summit of the surrounding Black Mesa State Park & Nature Preserve. Operated by the Oklahoma Wildlife Department, you can enjoy trout fishing between November 1 and April 30 at Lake Carl Etling, or reel in flathead catfish, walleye and varieties of bass year round. Hook up your RV and stay awhile, or just stop for a meal at one of the lake’s picnic areas while you plan the day’s hike. After you see Oklahoma from its highest point on the Black Mesa Summit Trail, you’ll find even more adventure waiting for you back at lower altitudes. You definitely won’t want to miss the preserved dinosaur tracks cutting through the east end of Black Mesa, or the large pieces of petrified wood scattered throughout the park. You’ll be wiped out after your 8.4-mile hike, so plan to take a load off at Hitching Post Lodging & Ranch in Kenton, a working guest ranch with several cozy lodging properties designed to meet a variety of needs. Be sure to stop in Boise City on your way out and snap a selfie with one-of-a-kind roadside oddities like Cimmy the Dinosaur and the Tin Woodsman as souvenirs from your adventure through No Man’s Land. Marked by majestic mesas and endless swaths of shortgrass prairie, Red Carpet Country is home to some of the most unique lakes in Oklahoma. Is there any feeling better than sand between your toes? Come to Fort Supply Lake and take a dip at one of the area’s white sand beaches. Featuring 26 miles of shoreline and several RV and tent camping sites, this oasis in northwestern Oklahoma invites visitors to slow down and enjoy the natural environment in a setting that offers plenty of scenic views and fun recreational opportunities. Whether you’re looking for a good place to cast your line, take the boat for a ride or host your next outdoor family get-together, Fort Supply Lake has got you covered. The nearby town of Woodward has plenty to love as well. Immerse yourself in history and culture at the Plains Indians & Pioneer Museum, where you can see vibrant works of art and tour the Lee-Lienemann Cabin, a fascinating piece of Oklahoma history built in 1869 at Fort Supply. You can also beat the summer heat at the Crystal Beach Aquatics Center, or do some shopping at the many local businesses located in the Main Street Woodward Shopping District. Come see what Woodward has to offer on your next trip to Fort Supply Lake.